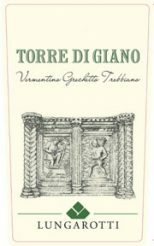 The name recalls the Roman origins of Torgiano, which is testified to by the tower dedicated to Janus (Giano), the double‐headed god. Terroir: Produced from clay based soils with good water retention. Vinification: Produced exclusively with free-run juice, after brief cryomaceration, it is vinified in stainless steel at low temperature. Kept on the fine lees until bottling and at low temperature during the entire process. Delicate, with long-lasting hints of white fruit and citrus on the bouquet. Dry with solid structure, elegant initial impact, fresh and fragrant evolution; pleasantly fruity with a pleasant acidic vein and long persistence with a refreshing finish. "Light-bodied and aromatic, this bright white offers a crowd-pleasing mix of star fruit, green melon, ground ginger and verbena notes. A fresh summer sipper. Drink now." "Dried cherry blossom, dried herbs and some papaya. Medium body, medium acidity and a straight-up finish. Drink now."